If you haven’t yet made a gift to School Sisters of Notre Dame, Africa this year we have an exciting opportunity that might sweeten the deal for you! 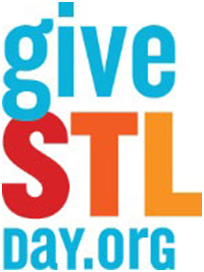 On May 6, School Sisters of Notre Dame, Africa will join more than 500 nonprofit organizations in the St. Louis metropolitan region for GiveSTL Day, a community-wide, 24-hour online fundraising event organized by the Greater St. Louis Community Foundation. The goal of GiveSTL Day is to inspire the community to come together for 24 hours to contribute as many charitable dollars as possible to support the work of local nonprofit organizations, including School Sisters of Notre Dame, Africa. From midnight to midnight on Tuesday, May 6, make a gift to School Sisters of Notre Dame Africa at http://givestlday.org//#npo/school-sisters-of-notre-dame-africa-province and you’ll be entered to win a variety of prizes from the St. Louis Cardinals. Plus, your gifts made during that 24 hours may be amplified by prize and matching dollars for School Sisters of Notre Dame Africa. For the full schedule of prize and matching dollars, please click. Categories: Uncategorized | Tags: Africa, GiveSTL, nonprofit organizations, School Sisters of Notre Dame, School Sisters of Notre Dame Africa | Permalink. Celebrating 40 years in Ghana! All those celebrating the 40th anniversary. Hurrah for our Ghana-based crew. To accomplish what we were sent to do. 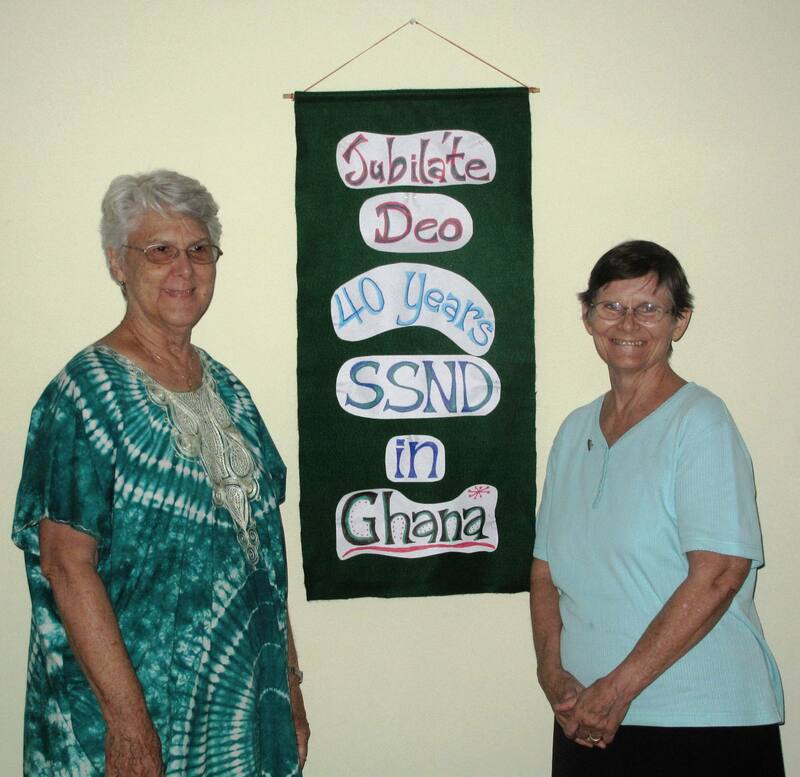 The 28 School Sisters of Notre Dame (SSND) who minister in Ghana came to Sunyani for an Area Meeting at the Novitiate, March 13 – 16, during which they celebrated the 40th anniversary of SSND in Ghana. 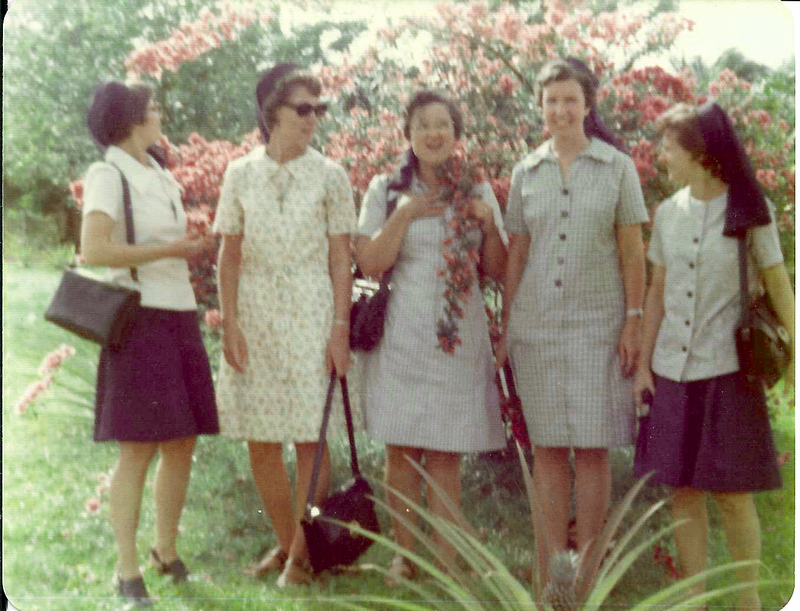 Two of the original five sisters who came on Feb. 17, 1974 are still ministering in Ghana. All the SSNDs, wearing our Province of Africa cloth, celebrated Eucharist with the people of Sunyani/Fiapre on Sunday morning at the parish church. The pastor informed the parishioners about the works of the sisters, and introduced the Area Leader, Sister Elizabeth Newman, and Sister Mary Ann Matachinskas, the two pioneers . Sister Elizabeth spoke of the welcoming spirit of the Ghanaian people. 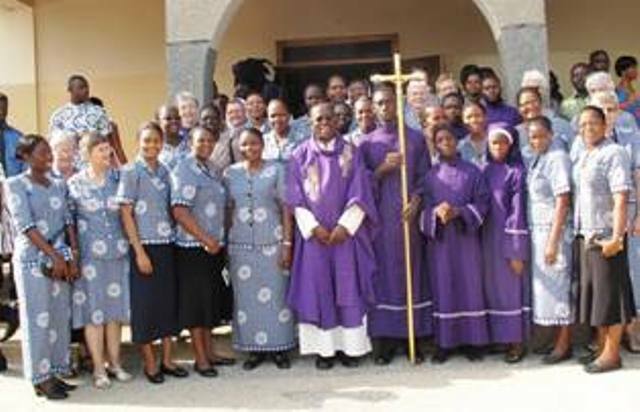 Sisters from Ghana, Nigeria, Kenya, Poland, Germany, United States, and Canada work together in four major ministries and in SSND formation in Ghana. Mary, Queen of Peace School in Cape Coast was founded in 1991 and still is led by Sister Mary Ann. The school grew year by year, and now it comprises kindergarten, six elementary grades, and a junior high school. In August, 2014, the first year of a senior high school will be added. It is a strong, independent Catholic school with deep community support. Among the teachers are two SSNDs and a group of lay teachers with a long commitment to the school. Mary Ann was formerly National Director of Catechetics for Ghana. Sister Elizabeth directs the Orthopedic Training Center at Nsawam. She taught in school in her first year of ministry in Ghana, but then joined the staff of this Center in 1975, and eventually became its director. The Center workshop makes prosthetic devices to enable handicapped people to walk, and provides training to use these devices. The services range from physical therapy for babies with club feet to a residential school for children who are relearning to walk. Many adults also take advantage of the Center’s services. OTC is known all over Ghana, and, through a traveling clinic, it serves handicapped people throughout the country. 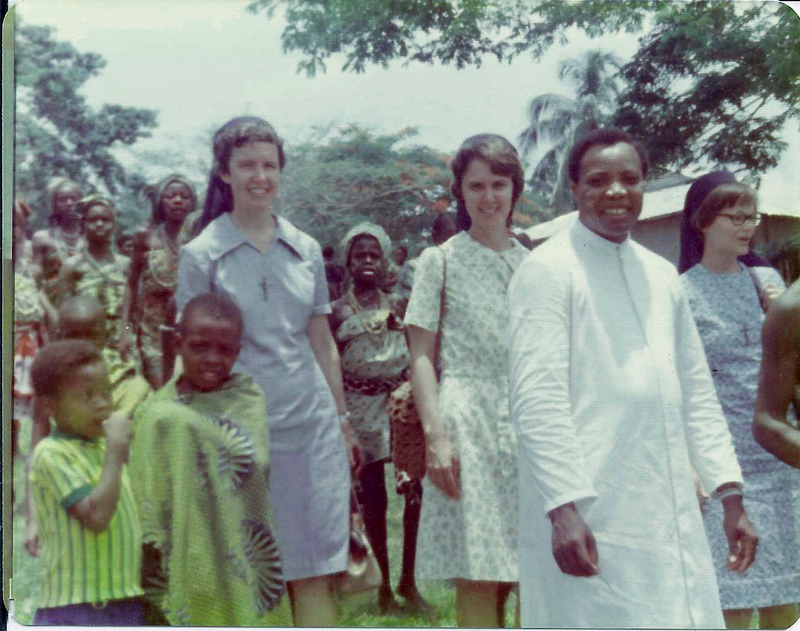 Sister Cecelia Gross has been Administrator of Notre Dame Clinic, also in Nsawam, since 1988. The chief mission of the Clinic is midwifery; it is helping to reduce the problem of maternal deaths and lack of pre-and post-natal care in the area. However, it also serves as multi-purpose clinic for all the health needs of the surrounding community. Sister Carolyn Anyega, Headmistress of Notre Dame Girls Senior High School, Fiapre, led the celebration of the school’s 25th anniversary this year. Over 700 students, most of them living in the school’s dormitories, appreciate the strong academic program and the beautiful campus. Three SSNDs teach in the school, which has a large lay teaching and non-teaching staff. The SSND Novitiate in Fiapre, where young African women are imbued with the spirit of the congregation and prepared to take religious vows, is directed by Sisters Delia Calis and Mara Frundt. They are assisted by three other SSND teachers. In addition to Ghana, the 70 SSNDs in Africa minister in Nigeria, Kenya, Sierra Leone, and The Gambia. Sisters Liz and Mary Ann who were in the first group to come to Ghana. Sister Liz and Mry Ann offer reflections. Some of our African Sisters who were present for the Celebration. S. Kthleen Feeley offers a poem of remembrance. A toast to the future. It wouldn’t be African without dancing! Categories: Uncategorized | Tags: Ghana, School Sisters of Notre Dame, Sister Elizabeth, SSND | Permalink.